The strike wave this spring was by far the biggest spike in teacher strikes in a quarter-century. The strikers included educators from North Carolina (123,000), Arizona (81,000), Colorado (63,000), Oklahoma (45,000), West Virginia (35,000), Kentucky (26,000), and Jersey City (3,600). These figures come from the Bureau of Labor Statistics, which tracks “work stoppages” (strikes and lockouts) involving 1,000 or more workers and lasting one or more shifts. The agency gathers its data from public news sources, such as newspapers and the Internet. We also looked back over the past quarter-century. 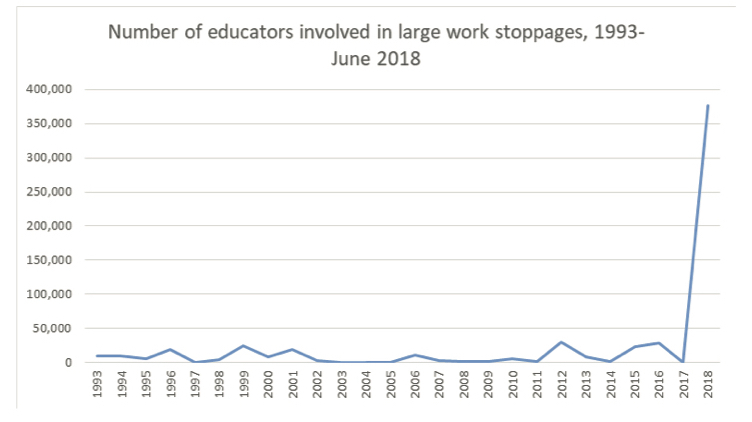 Until this year, few educators were involved in large work stoppages. Some years the number was zero. The biggest years involved around 30,000 educators, like the Chicago Teachers Union strikes in 2012 and 2016. To put this year’s upsurge in perspective, in 1946, about 14 percent of all U.S. workers were involved in strikes. In 1919, it was about 21 percent. Both years had over 4 million strikers. Our figures for 2018 don’t yet include the teacher strikes around Washington state in September—or the big ones that may still be ahead this fall in Los Angeles and Oakland. Stay tuned! You can follow the BLS monthly work stoppage data yourself at www.bls.gov/wsp. Jasmine Kerrissey is a faculty member of The Labor Center and Assistant Professor of Sociology at the University of Massachusetts, Amherst. She’s a proud member of the Massachusetts Teachers Association.